Excellent downtown location!! Pets welcome with prior approval and pet cleaning fee! This home takes you back to simpler times. 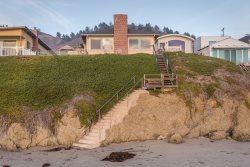 This Classic Cayucos beach house is located right across the street from the beach and walking distance to shops, restaurants, Tavern, beach and pier. Ocean views from living room, dining room and master bedroom. 2 bedrooms and 1 bathroom (with extra large shower) located downstairs. Master bedroom (king bed), 2nd bathroom, kitchen, living room and dining room located upstairs. High ceilings throughout house. Welcoming lanai with large table for family dinners, gatherings and game nights. Perfect home for families with small children-located on a cul de sac. 4 parking spaces available for tenant use. Call us today to rent this Cayucos classic!